There was an outstanding article from Don Curren today on Canadian debt levels. You can read it here. The article references some new data courtesy of the Canadian Centre for Policy Alternatives. As I have been mentioning for well over a year on this blog, Canada has a serious debt problem which is particularly acute in the household sector. New mortgage loans have been growing exponentially and is a primary factor behind surging house prices. In the past 5 years, Canada has accumulated more debt than any other advanced economy. Private sector debt to GDP has surged 20% in this time. There’s plenty of research which suggests the tipping point for private sector debt appears when the debt to GDP ratio grows by 17% in five years. Which we surpassed in early 2016. 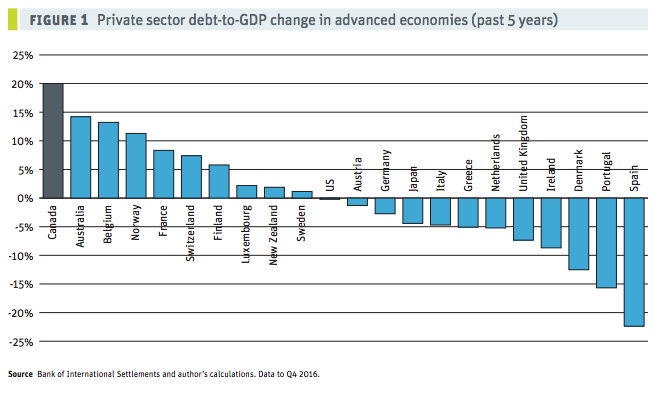 Canada leads advanced economies in debt accumulation. Canada has never before led advanced economies in debt accumulation. The last time it came close was in the early 1990s when it stood briefly in third place—only to see housing prices tumble. It’s important to understand the relationship between debt and house prices. When banks give you a mortgage (debt), they are ultimately creating new money that otherwise never existed. By expanding the money supply and providing more mortgage loans (debt) this allows house prices to continue rising. Here’s a quick video to explain it in more simple terms. When you reduce debt, you reduce the overall money supply and thus there’s less money available to support high house prices. Fortunately, or unfortunately (if you’re a politician) there’s a ceiling to how much debt households can absorb. 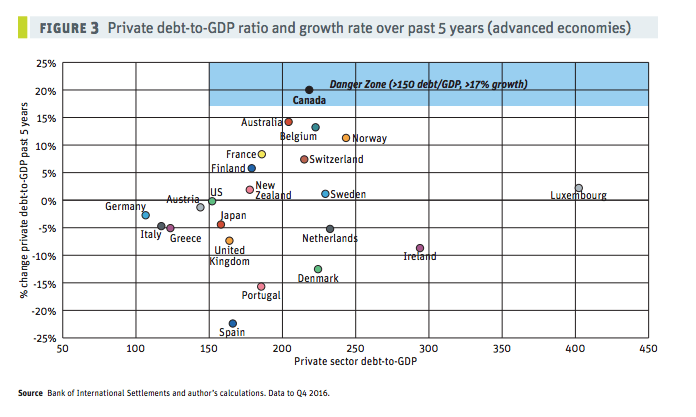 Canada finds itself, located squarely in the “danger zone” with private debt-to-GDP of over 150%. While the timing is near impossible, Canada’s debt party seems to be in the final hours. So while everyone’s throwing back a few more drinks, and the musics still playing, an unavoidable hangover will be there to greet us in the morning.